Clean Pet Stains With This Everyday Household Item! You learn something new every day. Today, my something was an effective way to clean pet stains from carpet using this everyday household item you may already have in your medicie cabinet!! 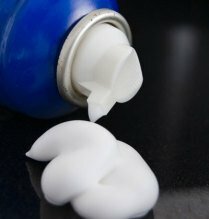 As odd as it may sound, simple white foam shaving cream can be used to remove a variety of organic stains including blood, urine, and feces. Simply dampen the stained area with a bit of water and then spray the stain with enough shaving cream to throroughly cover the stain. Allow the shaving cream to sit on the stain for a few minutes. Then rub the shaving cream in with a sponge or brush and allow it to sit a few more minutes. Wipe up remaining cream with cool water using rags or sponges and voila! The stain should be gone! When the area is dry, vacuuming should remove any remaining dried foam. So far, my family has used this successfully on blood, a dog accident, and a cat hairball spot, and it is a life-saver! 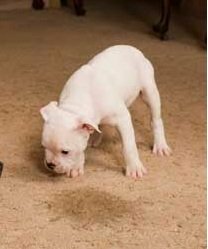 We did not observe any discoloration of our white or beige carpet, but of course, as with any cleaning agent, you should try a test spot in a hidden area of the carpet first. But overall, this trick seems to work great! What tried-and-true cleaning tricks do you use for pet stains? For more great pet care tips, see our best Pet Care articles. Cats Superior To Dogs According To Robert De Niro & MIT - And Better Drinkers To Boot!